Welcome to Western Biogas Systems A Division of Bozco Engineering Inc.
Western Biogas Systems, a division of Bozco Engineering Inc. has over twenty years of experience in the industrial market place. Efficiency ratings of industrial biogas plants are based on throughput results. Stoppages and malfunctions resulting in downtime cost the operator money. Any reduction in the efficiency of one or more units will impact the output of the plant. Western Biogas System’s primary goal is to protect power generation devices such as engines, fuel cells and turbines that can be damaged by harmful constituents contained within untreated biogas. We specialize in finding the best solutions for removal of Siloxanes, H2S, moisture, VOC’s and particulates in Methane gas for use in engines, turbines & fuel cells. 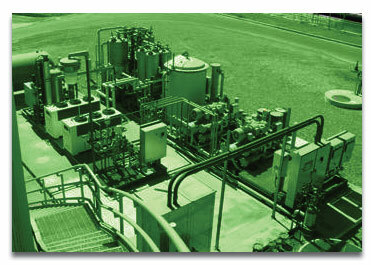 Additionally, we specialize in the removal of CO2 for pipeline quality injection. Effective biogas conditioning starts with evaluation of the best options available to accomplish a client’s unique goals. As not every goal is the same, so may be true regarding the incoming gas specifications. At Western Biogas Systems, we consult with each client, evaluating their best options for: dehydration, gas boosting, H2S removal, Siloxane removal as well as removal of other gas constituents. Western Biogas Systems custom engineers and fabricates these systems based on site specific data. Our capabilities to meet the most stringent gas specifications in the industry provide our clients with opportunities to convert waste to energy and pipeline quality gas. Effective biogas conditioning starts with evaluation of the best options available to accomplish a client’s unique goals. As not e very goal is the same, so may be true regarding the incoming gas specifications. At Western Biogas Systems, we consult with each client, evaluating their best options for: dehydration, gas boosting, H2S removal, Siloxane removal as well as removal of other gas constituents. Siloxanes are produced in digesters at wastewater treatment plants and landfills. Siloxane is a chemical used extensively in industrial products such as personal care products and lubricants. Damage to engines, turbines and fuel cells frequently occurs due to the presence of Siloxane, resulting in large maintenance or replacement costs for various facilities. Additional concerns occur with the resulting decrease in power generation. The most cost effective method of Siloxane removal incorporates simultaneous dehydration & Siloxane removal in one step. It is an ideal solution to remove harmful water vapor to improve the combustible quality of landfill gas and biogas, especially when the inlet gas temperature is between 100° and 110° F. Product features include: patented dew point sensors and flood level controls, stainless steel heat exchanger tubes and moisture separators and modular construction for ease of servicing. Particulate removal accomplished thru particulate filtration sized down to .1 micron or less.